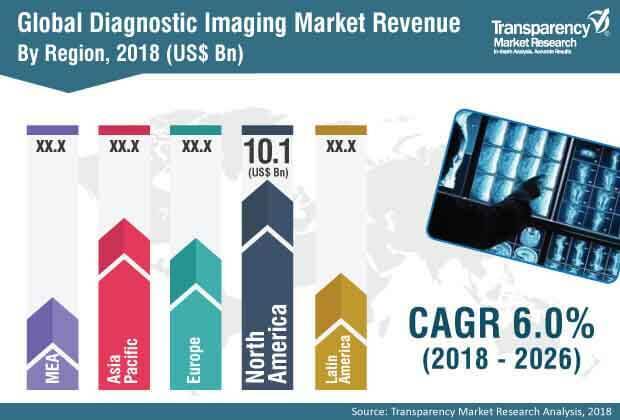 Diagnostic Imaging Market (Product - X-ray, MRI, Ultrasound, CT and Nuclear Imaging; Application - Cardiology, Gynecology/Obs, Orthopedics and Musculoskeletal, Radiology, Neurology and Spine, General Imaging; End use - Hospitals, Diagnostic Centers) - Global Industry Analysis, Size, Share, Growth, Trends, and Forecast, 2018-2026. Diagnostic imaging is a technique used to conduct a wide range of non-invasive imaging tests for diagnosing and monitoring diseases or injuries by the way of generating images that represent internal structures and organs in the patient's body. Healthcare practitioners are extensively using diagnostic imaging technologies to examine patients and diagnose their exact medical conditions. Diagnostic imaging is utilized to identify a wide range of issues including, but not limited to, cardiac abnormalities, broken bones, aneurysms, gastrointestinal issues, and various types of cancer. Apart from identifying issues and diagnosing them, diagnostic Imaging is also employed to monitor how the patient’s body responds to the treatment being dispensed. The global diagnostic imaging market was valued at around US$ 28.0 Bn in 2017. It is estimated to reach a value of more than US$ 47 Bn by 2026, expanding at a CAGR of 6.0% during the forecast period. Rise in prevalence of chronic diseases, such as cancer and cardiovascular events, increase in the geriatric population, and advancements in technologies to develop various diagnostic imaging devices to be used in different surgical procedures are key factors that are estimated to propel the market during the forecast period. The ability of diagnostic imaging to diagnose a disease in its early stage and greatly improve patient outcomes has driven the diagnostic imaging market due to the fact that it is painless and offers rapid diagnosis. Consequently, it is a popular recourse among doctors as well as patients. Rapid innovations and favorable reimbursement policies are also propelling the global diagnostic imaging market. Diagnostic imaging provides an opportunity to exclude expensive therapeutic treatments, consequently causing substantial saving. The global diagnostic imaging market has been segmented based on product, application, end-user, and region. In terms of product, the market has been classified into X-ray, MRI, ultrasound, CT, and nuclear imaging. The X-ray segment is expected to lead the market during the forecast period, due to the ability of X-ray to produce accurate images that provide a clear idea of the musculoskeletal system. Moreover, it is also a low-cost technique. The ultrasound imaging segment is projected to follow the X-ray segment, in terms of market share, during the forecast period. In terms of application, the global diagnostic imaging market has been divided into cardiology, gynecology/obs, orthopedics & musculoskeletal, radiology, neurology & spine, general imaging, and others. Among these, the gynecology/obs segment dominates the market due to the high demand for performing ultrasound imaging technique in this application segment. Furthermore, the cost associated with the ultrasound technique is higher as compared to X-ray technique. In terms of end-user, the global diagnostic imaging market has been classified into hospitals, diagnostic centers, and others. The diagnostic centers segment is expected to lead the global market during the forecast period, as diagnostic imaging is highly preferred in these centers since these centers are facilitated with all the latest technologies for quick and accurate diagnosis. In terms of region, the global diagnostic imaging market can be segregated into North America, Europe, Asia Pacific, Latin America, and Middle East & Africa. North America is expected to lead the global market from 2018 to 2026, due to rapid technological advancements and rising prevalence of cancer and cardiac diseases in the region. Asia Pacific is expected to follow North America, in terms of share of the global market, during the forecast period. Majority of the diagnostic imaging devices are being manufactured by key players covered in this report, and these include GE Healthcare, Koninklijke Philips N.V., Hologic, Inc., Siemens Healthcare GmBH, Fujifilm Corporation, Toshiba Medical Systems Corporation, Shimadzu Corporation, Carestream Health, Inc., Hitachi Ltd., and Samsung Medison. This report on the diagnostic imaging market analyzes the current and future scenario of the global market. Rise in geriatric population that requires diagnostic imaging to treat and diagnose their afflictions, high prevalence of chronic diseases, such as cancer, and intensive research activities being performed to determine the various applications of imaging techniques in different surgical procedures are major factors driving the global diagnostic imaging market. The diagnostic imaging market report comprises an elaborate executive summary, which includes a market snapshot that provides information about various segments of the market. It also provides information and data analysis of the global market with respect to the segments based on product, application, end-user, and region. A detailed qualitative analysis of drivers and restraints of the market and opportunities has been provided in the market overview section. Additionally, the section comprises competitive matrix and company profiles with business overview to understand the competitive landscape in the market. This section of the report also provides market attractiveness analysis, by geography and market share analysis by key players, thus presenting a thorough analysis of the overall competitive scenario in the global diagnostic imaging market. The overall diagnostic imaging market has been segmented based on product, application, end-user, and region. Furthermore, in terms of product, the diagnostic imaging market has been classified into X-ray, MRI, ultrasound, CT, and nuclear imaging. The X-ray segment is likely to account for a leading share of the global diagnostic imaging market during the forecast period, owing to the wide usage of X-ray images in displaying any injury or deformities in the skeletal system. Based on application, the diagnostic imaging market has been segregated into cardiology, gynecology/obs, orthopedics & musculoskeletal, radiology, neurology & spine, general imaging, and others. Increasing utilization of ultrasound technique in gynecology is likely to fuel the gynecology/obs segment in the next few years. Based on end-user, the market has been split into hospitals, diagnostic centers, and others. The market size and forecast for each of these segments have been provided for the period from 2016 to 2026, along with their respective CAGRs for the forecast period from 2018 to 2026, considering 2017 as the base year. In terms of region, the global diagnostic imaging market has been categorized into five major regions and the key countries in the respective region are: North America (the U.S., Canada), Europe (the U.K., Germany, France, Spain, Italy, and Rest of Europe), Asia Pacific (India, Japan, China, and Rest of Asia Pacific), Latin America (Brazil, Mexico, and Rest of Latin America) and Middle East & Africa (South Africa, GCC countries, and Rest of Middle East & Africa). The market size and forecast for each of these regions and the mentioned countries have been provided for the period from 2016 to 2026, along with their respective CAGRs for the forecast period from 2018 to 2026, considering 2017 as the base year. The research study also covers the competitive scenario in these regions. The report also profiles major players in the global diagnostic imaging market based on various attributes such as company overview, financial overview, product portfolio, business strategies, and recent developments. Major players operating in the market include GE Healthcare, Koninklijke Philips N.V., Hologic, Inc., Siemens Healthcare GmBH, Fujifilm Corporation, Toshiba Medical Systems Corporation, Shimadzu Corporation, Carestream Health, Inc., Hitachi Ltd., and Samsung Medison.